Many people don’t realize that what dentists call silver fillings are actually made of an amalgam of mercury and silver and that they are about 50 percent mercury. It isn’t surprising that people are nervous about having mercury, which is toxic, in their mouths. Studies have shown that small levels of mercury vapor are released from these fillings during chewing. Dr. Thein feels that there are many advantages to using white composite fillings for the teeth. They bond to the tooth, making it stronger. 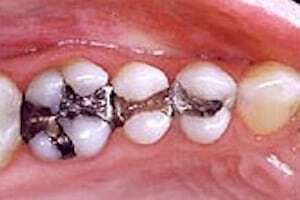 Amalgam fillings conduct heat and cold, which can be irritating to the teeth—composite fillings insulate the teeth. 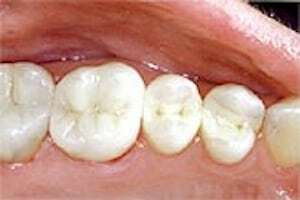 Composite fillings also can be made to match the tooth color. And, of course, they contain no mercury. Dr. Robert Thein of Glendale is a mercury-free dentist. He strongly prefers placing the white composite fillings. 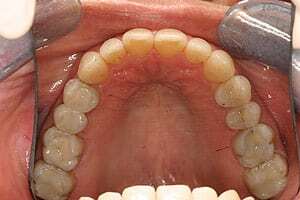 Some patients ask to have all their old amalgam fillings removed and replaced with composites. While Dr. Thein doesn’t encourage the removal of fillings that are intact and functional, he respects requests by patients to remove amalgams. If it is important to you, he can do what is called “hygienic mercury removal,” where your old fillings are removed in such a way that you don’t inhale any of the vapors or swallow any of the debris. This patient was unhappy with her unsightly silver fillings. The patient asked Dr. Thein how to eliminate the silver fillings from her teeth. Dr. Thein replaced the old amalgams with custom designed porcelain in-lays and on-lays. They’re white, clean and last for years.